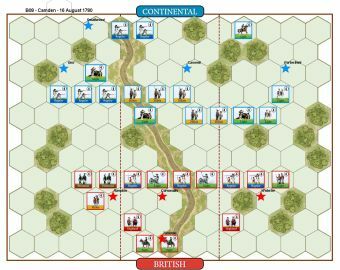 Lacking sufficient men to attack the British in Camden, Green retired north and occupied a strong position on Hobkirk’s Hill. 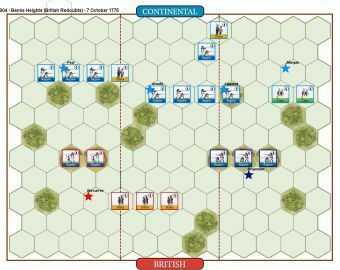 Green hoped that he could draw Rawdon out of Camden and defeat him in an open battle. 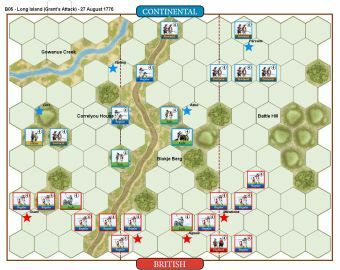 Rawdon, concerned that Marion and Lee might reinforce Green, began making plans to attack the Continental army. 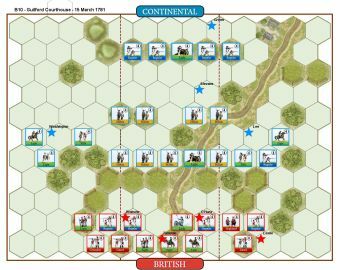 Moving forward on a narrow front, Rawdon overwhelmed the Continental front line of pickets. 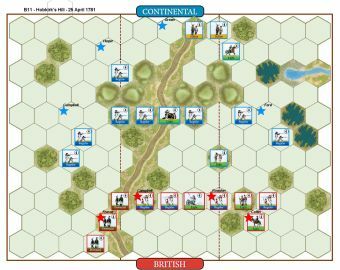 Green, seeing the nature of the British attack, sought to overlap Rawdon’s flanks with his larger force and ordered his flank units to attack. 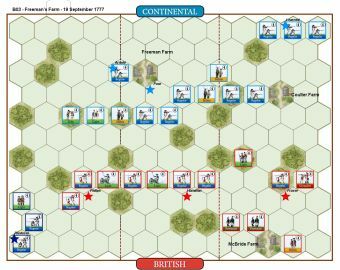 As the two sides neared, two Continental leaders were wounded, which caused confusion in the ranks. 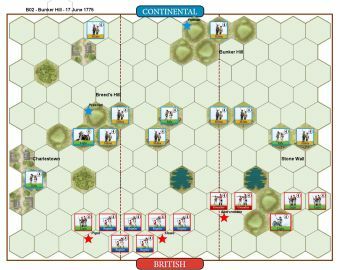 Rawdon continued to press the attack and under this pressure and without commanding officers, the Continental line broke. 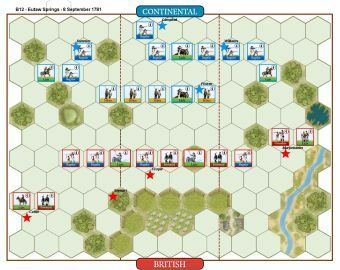 Seeing that the battle was lost, Green directed his remaining men to retreat north and ordered Huger to cover the withdrawal. 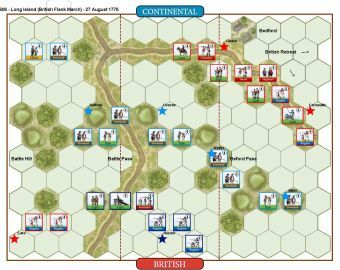 • The British player gains 1 Temporary Victory Banner at the start of his turn for each hill hex occupied by a British unit. 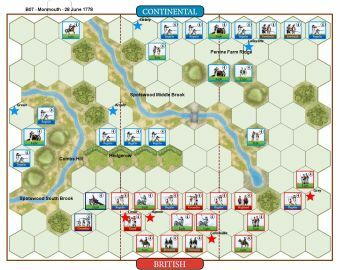 • The Continental player gains 1 Temporary Victory Banner at the start of his turn if the British do not occupy any hill hexes. 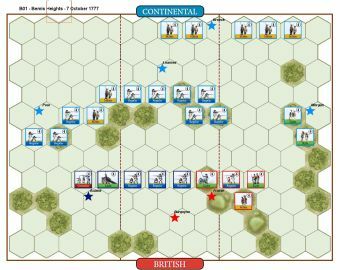 Place a Victory Banner on a hill hex at the start of the battle. 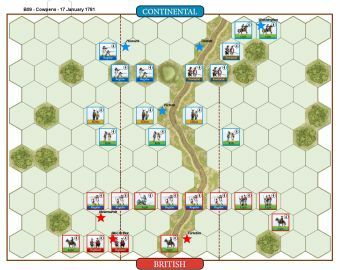 • The road hex on the British baseline is a Temporary Victory Banner Objective worth 1 banner for the Continental player when a Continental unit occupies it at the start of his turn. • The stream is not fordable.